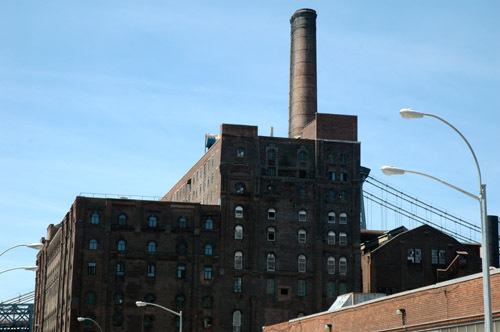 The Waterfront Preservation Alliance has requested that the old Domino Sugar plant in Williamsburg be designated as a landmark. The formal request was made on Tuesday, according to Brownstoner. Back in June, we reported on Curbed that the Prese rvation Alliance was launching a petition, letter-writing and postcard-sending drive to convince the Landmarks Commission to extend landmark status to some of the buildings on the huge East River site. The persuasion campaign was also aimed at Councilman and Congressional candidate David Yassky, who opposed the landmarking of 184 Kent, but has, according to Brownstoner, signed on with to the Domino landmarking effort. Developers bought the Domino site in 2004, but the site was not included in the waterfront rezoning that permits highrises up to 40 stories. So, a rezoning is still pending. If you want a vision of the possible future without landmarking, check out Leah Kreger's excellent and very detailed article in the current Brooklyn Rail. 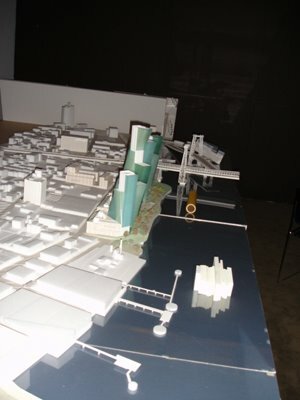 The story contains a wealth of information about the proposed development--which could include four towers up to 40 stories each--and, most interesting, a photo of the Rafael Vinoly preliminary plan for the site, which we are reproducing here. The Preservation League of New York State and the Municipal Art Society are among the groups supporting Domino landmarking.